$25 Target Card and Wanchai Ferry Giveaway! Have you ever had a craving for Chinese food but didn´t feel like dealing with the hassle of going out? 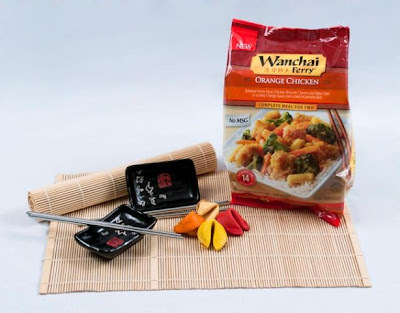 Next time, why not stay at home and satisfy your craving with Wanchai Ferry Orange Chicken? This Wanchai Ferry “Perfect Night In” prize pack that includes one VIP coupon valid for a free package of any of the Wanchai Ferry frozen entrees, in addition to a set of great Asian-inspired rice bowls, chopsticks, bamboo place mats, flavored fortune cookies, and a $25 Target gift card. I received this fun package last week from Wanchai Ferry through My Blog Spark. I whipped up the Wanchai Ferry meal for my husband. It was very quick and easy to put together. We were also thrilled to get some more chop sticks and serving dishes! You know I used my gift card to buy some fancy dancy gear for my kitchen. I bought some great stack-able wire racks (I have been using some I got at the dollar store!) and a bunt pan. I am ashamed to say, I have never owned one before. Yes. It’s true. I’m excited to try out several great recipes. MyBlogSpark would like to send one of these gifts packages to one of my readers. Hooray! your favorite Asian dish or why you like to shop at Target. You have until Thursday night at midnight to enter. I will choose a winner randomly, and post the name of the lucky guy or gal on Friday morning. Good luck everyone and thanks to Wanchai Ferry and MyBlogSpark for this opportunity. I love fried rice. Thanks for the great giveaway! My best cheap date idea is to enter every giveaway you can find for movie tctieks and look for coupons for buy 1 get 1 free dinners. My daughter and I went to see Harry Potter at Imax yesterday with free movie tctieks and then we went to Subway for dinner. The whole thing cost me $6 because I the free movie tctieks were only good up to $12 each, but IMax was $15. And I had won a Subway GC.This is not to say that I go on dates with my daughter LOL. I’m just pointing out that I could just as easily have done this on a date. And the whole thing would have been free if we’d gone to a regular movie and not the IMax that she really wanted to see. My favorite Asian dish is Pad Thai, and I also love Super Target, I found a humidifier there on Saturday, it was marked down 50% and I only paid $19.98 for it – AMAZING!!! Anyway, I am new to your blog, and I absolutely love it. Guaranteed I'll be checking in every morning – but don't tell my boss!!! General Tso's Chicken is my favorite! Thanks for the giveaway! Crab Rangoon is my favorite-dipped in sweet and sour sauce. I could eat it everyday. Target I love because I can always find a bargain there. My husband cringes when I say I am going to Target, he knows he won't see me all day. I have 5 Targets within 10 miles of our house. Jamie Cooks It Up! follower via Google. I made your chicken chow mein recipe last night, and we loved it! Even my husband said he liked it (and he doesn't usually like chow mein) and he had seconds and thirds! In the winter it’s ice skniatg at the free rink near the high school, followed by hot cocoa and snuggling.You might appreciate the song by Gypsy Reel (I’m not selling, I just think they’re pretty good and it’s a funny song). Lines include: It don’t matter if you’re pretty, it don’t matter if you’re rich; if you drive too fast on ice you’re gonna wind up in a ditch. and It takes me twenty minutes just to put on all my clothes. Gotta squeeze in to my thermals from my ankles to my nose. It even acknowledges mud season.